We’re extremely excited to announce the launch of our public service site- #onholdwith. 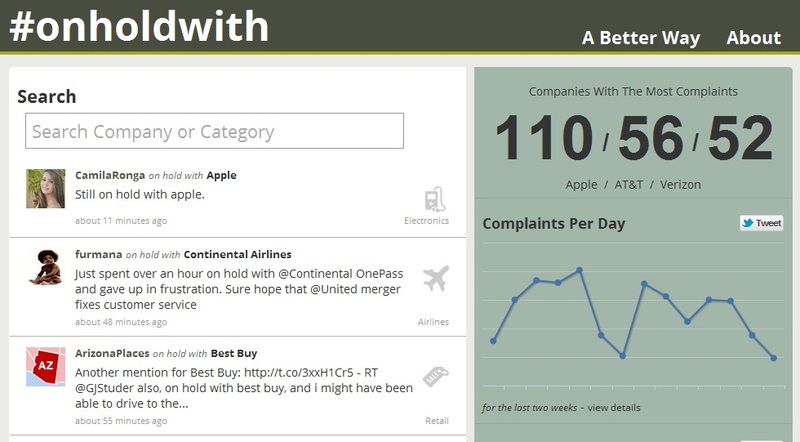 #onholdwith tracks complaints about waiting on hold with companies, by looking through public twitter feeds and aggregating the results by company and by industry. This lets us generate some pretty interesting statistics, and keep a consistent history of complaints over time. We are providing this as a public service so that companies can see how much goodwill they are losing from their customers and so that people will feel like their complaints are not going unheard. Want to be included in the stats? Just use the #onholdwith hash tag and the company name when you complain about being on hold, and our system will automatically include your tweet in real-time! This entry was posted in #onholdwith, Fonolo and tagged fonolo, onholdwith on 2011/12/19 by mike.